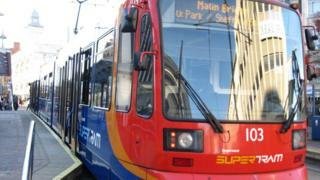 A £58m project to run trams on railway lines in South Yorkshire is a year behind schedule. The tram-trains service, linking Sheffield, Meadowhall and Rotherham via local tram routes and Network Rail lines, was due to start this year. Network Rail apologised and said it was waiting for approval from the transport secretary to build 150m (164yd) of track at Tinsley. It said the full tram-train service would "not be introduced until 2017". An application to connect both the tram and rail networks at Tinsley was submitted on 13 March. In a statement, Network Rail said: "The combination of the complexity of the project, added to the need to apply for powers to build the link between the two networks means that the full tram-train service will not be introduced until 2017. "We apologise for this delay but remain positive that the introduction of tramtrain will not only benefit passengers in South Yorkshire but lead the way for many other similar schemes to benefit passengers around the country." The two-year pilot scheme is said to be the first of its kind in the UK. The tram-trains are expected to cut journey times and make it easier for people to get into the city and town centres. They are said to be lighter, more energy efficient and have faster acceleration and deceleration than conventional trains.